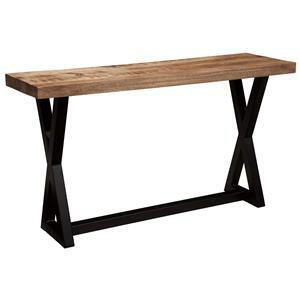 The trestle shape and weathered oak finish give this console table the look of architectural salvage that's so popular with today's vintage and farmhouse designs. The finish is a wire-brushed dry grey with brown undertones on rustic oak veneers. The Felton Vintage Sofa Table by Klaussner International at Beck's Furniture in the Sacramento, Rancho Cordova, Roseville, California area. Product availability may vary. Contact us for the most current availability on this product. These fresh new pieces feel like old treasures. Decorating with these vintage-inspired tables helps make a living room feel welcoming and lived-in. It starts with a timeless trestle design featuring X-shaped lattices. The oak veneers are finished in a distressed dry grey finish, creating a look that fits perfectly in with Farmhouse or Coastal designs. The Felton collection is a great option if you are looking for Relaxed Vintage furniture in the Sacramento, Rancho Cordova, Roseville, California area. Browse other items in the Felton collection from Beck's Furniture in the Sacramento, Rancho Cordova, Roseville, California area.